The integration is being framed as another way to edit and share documents for Dropbox Business teams. It complements the ability for users to edit such files with the Microsoft Office app suite. Those who already use Google Drive and its editing apps will see a familiar workspace with only one major difference: everything is working on the user's Dropbox domain. Once a user links up their Google account to Dropbox, new documents can be started from Dropbox's web, Windows, and macOS clients by tapping the "Create new file" button and selecting the appropriate app. 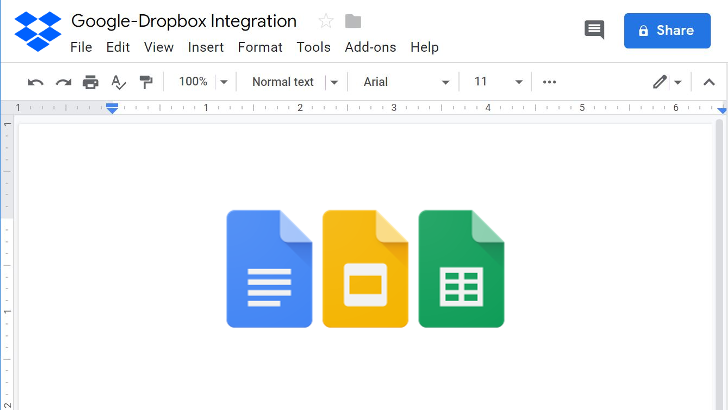 Existing .docx, .xlsx, and .pptx files can also be edited with the Google apps and are automatically saved in the original format so that Office users can continue working on them. Members in a Dropbox Business team will be able to share Docs, Sheets, and Slides files on a standalone basis, saving the hassle of creating new folders in their Dropbox accounts. Just as in G Suite, they can toggle sharing settings to lock the document down as view-only or give edit access to certain individuals, the whole Dropbox Business team, or even outsiders. The Android and iOS versions of the Dropbox app will only allow previews of files made in these apps as well as a download option for offline uses. All versions of Dropbox, however, will let users browse, move, copy, and delete these items. Dropbox's full-text search engine will be able to pick up on all the contents within those files and show relevant results down to the sentence. Dropbox will also send notifications whenever somebody makes a comment within a Docs, Sheets, or Slides project. Eligible Business teams who use Dropbox in English can sign up to participate in the beta program for these features through May 6. The company told Engadget that more users will be able to use Docs, Sheets, and Slides on Dropbox later this year.